Has brunch become a spectator sport? Between the long lines and yolk-breaking videos on Instagram, we might spend as much time watching other people enjoy their eggs benedict as brunching ourselves. It’s time to take back brunch. 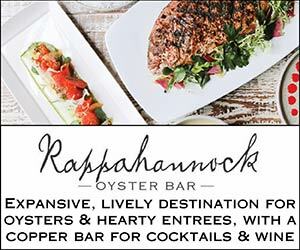 With an amazing spread around the Lowcountry. 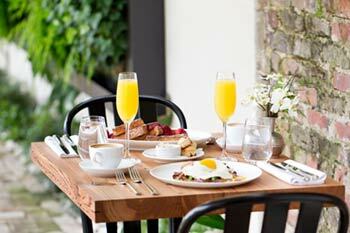 From the home-style Glass Onion occupying a little lot on Savannah Highway to Obstinate Daughter’s swanky loft on Sullivan’s to Basic Kitchen’s prime, hip real estate off King Street, there are enough options for everyone to go to brunch – and enjoy it, too. Brunch: Saturday, 10 a.m.-3 p.m. Celebrating a decade in business this year, the Glass Onion’s claim to fame is its traditional Southern style. Unassuming and “no fuss,” as Glass Onion’s Chris Stewart put it, this place feels like sitting down at a family friend’s dining room table. Only here, you can get French toast with fried pork chops or fried quail and an accompanying cocktail with local spirits like Highwire and Dixie. Brunch: Daily, 9 a.m.-3 p.m. Basic Kitchen – with its palm-tree-and-colorful-umbrella-filled back courtyard, bright and airy interior and carefully curated playlist – offers plenty of gluten-free and vegetarian options alongside locally sourced meats and seafood and a drink menu that features everything from house-made juices to wine and beer and fruity, frozen cocktails. This is likely the only spot on this list where you can get cauliflower grits and a frozen beet margarita. One of the OG brunch spots in Charleston, Poogan’s Porch was serving grits in its 1880s Victorian home setting 41 years ago, long before the hipster brunch renaissance. And yet, Chef Dan and his team still make everything from scratch. For him, Poogan’s is a gathering spot full of meaning, as well as good grits. 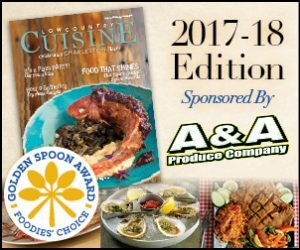 Brunch: Saturday-Sunday, 10 a.m.-3 p.m.
Full of funky decor and the aroma of Rose’s famous fried chicken, Ms. Rose’s is a mainstay in West Ashley. Beyond the wood slats and neon sign out front, you’ll find a retro diner vibe and a massive, loaded bloody mary at the bar. “I think our claim to fame brunch item is definitely Rose’s fried chicken. Not only is it our most beloved and talked-about offering, but the way people’s eyes light up when you place it in front of them is priceless,” said General Manager Tom Urban. 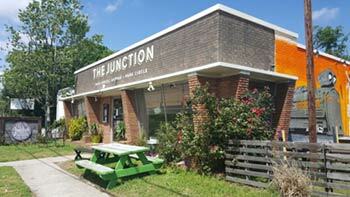 Brunch: Saturday-Sunday, 9 a.m.-3 p.m.
Brunch at The Junction was born from high demand. “We opened in February 2015, serving breakfast and lunch, and opened for brunch a month later due to demand from the neighborhood,” said owner Kimana Littleflower, who crafted a menu to please everyone. You’ll find their most popular item – cactus-braised pork, served with cheesy hash browns, black bean pico, an over-easy egg and an amazing house-made honey jalapeno chutney – alongside more traditional items like rotating sweet or savory chicken and waffles. It’s food your grandmother and your 20-something hipster friend will both love,” she said. Cannon Green might be known for its formal wedding affairs and 1840s house facade, but brunch is anything but traditional here. Every Sunday, the posh dinner spot turns into “Beats and Brunch,” with a local DJ spinning the soundtrack to Chef Michael Perez’ brunch service. Dishes are high-class takes on staples, things like lemon and buttermilk pancakes with blackberries, salted butter and maple syrup and baby beets salad with burrata, grapefruit, pomegranates and ligurian olive oil. Drink specials include tasty inventions like “Sunday Struggle II” with aquavit, Domaine de Canton, blackberries, sage and lemon. Once a month, themed brunches include 70s music or “The Breakfast Club,” where servers dress to match the theme. Brunch: Daily, 7 a.m. -7 p.m. This restaurant was born for brunch. 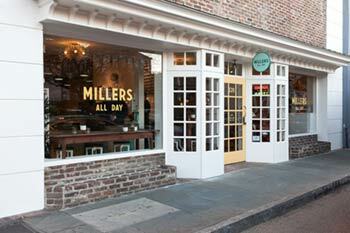 Opened this spring, Millers All Day is built on the belief that breakfast and cocktails should not be sequestered to opposite ends of the day. Brunch and booze reign from 7 a.m. until 7 p.m. While Millers is still a fledgling on lower King, it’s quickly drawing crowds for its sleek diner vibe – a mixture of white subway tile and a bar polished to high gloss. In the front window, a 172-year-old antique mill and 100-year-old grit separator that Millers co-owner Greg Johnsman (owner of Geechie Boy Farm) restored himself are on display. Both machines are the oldest of their kind in the country. Even this early in its tenure, one thing is certain at Millers: order the waffles. Served with bananas, sorghum, caramel and meringue, they are an experience. 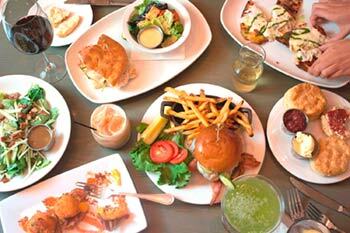 Brunch: Saturday-Sunday, 9 a.m.-4 p.m. Taking the “farm-to-fork” idea to new heights, Harold’s Cabin serves a rotating seasonal brunch menu from ingredients grown on the eclectic restaurant’s own rooftop garden. Once called “the coziest restaurant in South Carolina” by Food & Wine magazine, the cabin is rustic and neighborly, with wood paneling, tartan wingback chairs and Edison bulbs strung from the ceiling. Meals here match the décor: down home and comfortable. 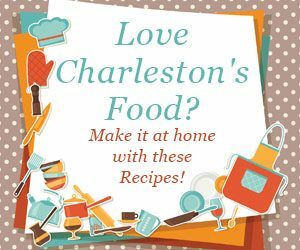 Real-butter biscuits, eggs in a nest and cornmeal fried shrimp are favorites. Try the French toast or chicken biscuit and gravy, both so fulfilling that they threaten to make your first meal of the day the only one you’ll need. Brunch: Sunday, 6:30 a.m.-2 p.m. True to its name, Lost Dog’s defining feature is dual patio dining areas, which are almost always full with four-legged friends alongside their dining companions. The Folly Benedict is a staple: one shrimp cake and one crab cake topped with “the best hollandaise sauce you will ever taste,” said Kruer. Hominy’s brunch comes from a tradition even older than the restaurant itself. 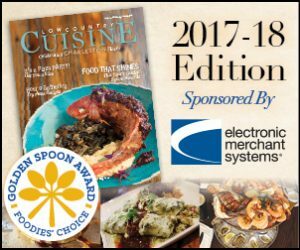 James Beard Award-winning chef Robert Stehling came up in the kitchen that put shrimp ‘n’grits on the map back in the early 1990s. He still uses that same recipe, and locals who’ve been brunching at Hominy since it opened in 1996 won’t eat it any other way. For the more adventurous, Stehling’s “Big Nasty” is a buttermilk biscuit with fried chicken breast, sausage gravy and grated white cheddar. A line is expected here, and, yes, it is worth standing in. Brunch at Sullivan’s Island’s The Obstinate Daughter is a meeting of unexpected extremes. “On any given Sunday morning, we will see a table of church-goers sitting next to a group of beach-goers ,” said General Manager Jonathan Bentley. Eggs and pizza meet in the classiest of ways at this refined coastal restaurant, where the usual craft cocktails and fresh oysters take a back seat on brunch days to the Old Danger Pizza. Freshly made dough is sprinkled with cheese and pancetta and topped with an egg that breaks open rewardingly when the guest slices in – whomever that may be. Brunch: Saturday-Sunday, 8 a.m.-2 p.m. If you want to try something everyone’s talking about, head over to Page’s Okra Grill in Mount Pleasant to try one of their classic dishes, such as fried green tomatoes or shrimp ‘n’ grits. 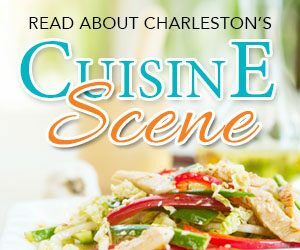 This local must-stop location, which has been featured on both the Food Network Channel and Travel Channel for their delicious Lowcountry food, is always packed with excited customers of both the first time and return variety. Pro tip: Don’t leave without trying their coconut cake. … you won’t be disappointed.